Kate Dickerson Hand painted Needlepoint Canvas KIT Damask eyeglass case 2 sides. Stitch painted on 18 count canvas. Includes canvas and threads as shown; 3 Vineyard silk, 1 planet earth 6 ply, 1 Vineyard overdyed and 8 Pepper Pot silks. Stitch a double sided eyeglass case, or have finished with a fabric back and make 2 separate eyeglass cases; 1 for you and 1 for a gift! The Nimble Needle is a brick and mortar needlework shop. All merchandise is brand new from current inventory and not from a private stash. When purchasing multiple items, add all items to your cart first. The item "Kate Dickerson Hand painted Needlepoint Canvas KIT Damask eyeglass case 2 sides" is in sale since Sunday, April 29, 2018. 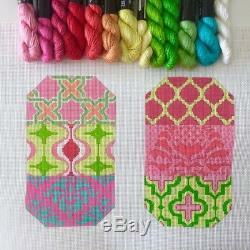 This item is in the category "Crafts\Needlecrafts & Yarn\Other Needlecraft Supplies". The seller is "nimbleneedle1" and is located in Merchantville, New Jersey. This item can be shipped worldwide.